i don’ cee darg’s naim onnit! I am astonished that Staff had the temerity to question who owns all the beds – Jeff, do not stand (or lie down) for this audacity. Staff, remember that all Jeff surveys belongs to Jeff, yes, that means you also. I wonder if there is anyone selectively breeding domestic short hair cats to achieve the largest orange cat possible? If not, I think we need to start. Obviously, giant orange domestic cats larger than 50 lbs can get dangerous when it comes to things like tuna deployment and grilling steaks, but that is a risk I’m willing to take. 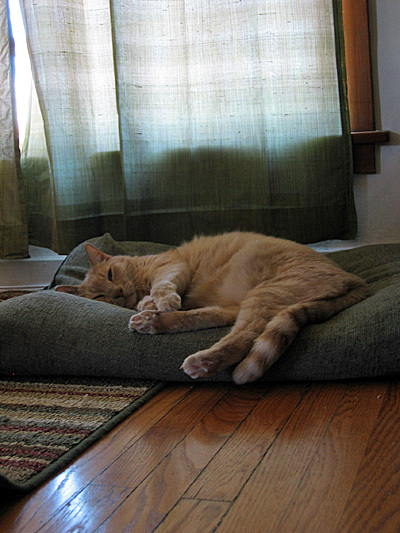 To a cat, anything that can be slept in, or on, or under, is a bed. Any bed being slept in therefore belongs to the cat. All your bed are belong to Jeff? I want the biggest orange cat possible! Jeffs DNA is the key.